Funky People were a house music collective with Tee Alford and Blaze (aka Kevin Hedge and Joshua Milan) at its core. Originally released on their Funky People label in 1995, this track, ‘Funky People’ landed on Slip ‘N’ Slide records the following year with a host of new mixes. 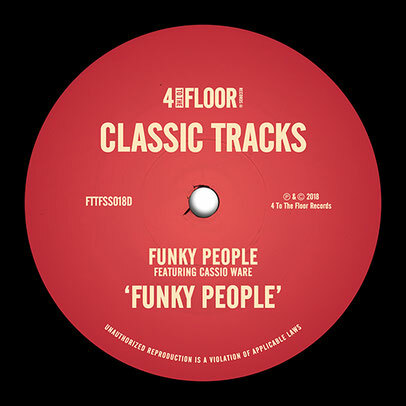 ‘Funky People’ is built around the vocals of Cassio Ware, apparently an underground pioneer of the scene. Hailing from New Jersey he was a regular collaborator with Blaze and a ubiquitous presence on many hits from that era. Alongside Blaze’s Klubhead versions, this package includes a remix from house royalty Masters At Work who lend their signature groove. Lenny Fontana brings his Vocal Mix adding new depth to the track while Knee Deep gives ‘Funky People’ a classic house spin with their Funky Mix. Rounding this package off is the Accapella, a DJ essential.